City Garden Pattaya. A modern 52sq.m one bedroom property, right in the heart of the city. 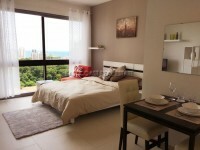 It’s very close to Pattaya beach, and even Jomtien beach is just 5 minutes away by transport. All of the major shopping malls have been built within easy walking distance, and the nightspots of Pattaya are very close by. City Gardens was developed with a large communal swimming pool, sauna, pool view gymnasium, underground parking, and excellent security. This unit is located on the ground floor and has nice garden views. The owner has done an extensive re-fit and has high quality fitted units throughout the property offering extra storage, it is furnished to a very high standard and really does feel bigger than the 52sq.m suggests. An open plan living room with fully equipped Western style kitchen and mood light sculpted ceilings, adjoined by a large en-suite bedroom which has floor to ceiling built in wardrobes and an impressive bathroom. The property is offered for sale fully furnished and is in Foreign Name Ownership.